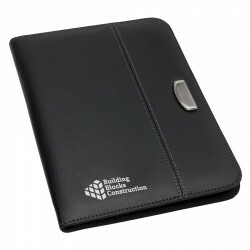 Branded Non Leather Compendiums make a great branded gift for your team building events. 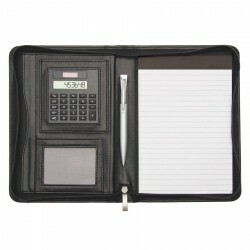 Practical and exuding with professionalism, these promotional compendiums from Promotional Product Experts come with a number of great features including notepads, business card holders, calculators, pen loops and multiple pockets. 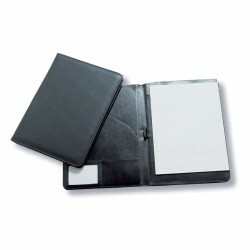 You can also choose from a variety of styles including zippered compendiums, non-zippered compendiums, portfolios and presenter folders and between A4 and A5 sizes. A5 two fold compendium, soft koeskin, colour co-ordinated document sleeve, business card holder, A5 lined pad. Colorful pen or USB memory holder on front cover as closure. Business card pocket and pen. Includes A4 writing pad. A4 two fold compendium, soft koeskin, colour co-ordinated document sleeve, multiple inside pockets, solar calculator, multiple pen loops, A4 lined pad. Pen not included. A5 zip round compendium. Soft koeskin PU,1000D nylon contrast, side and top entry for notepad, full zip closure, exterior side pocket, multiple inside pockets, microfibre gusseted inside pocket,elastic USB holders, elastic pen loop, A5 lined pad. Pen not included. A4 two fold compendium. Soft koeskin PU, 1000D nylon contrast, exterior side pocket, multiple inside pockets in microfibre, elastic pen loop, A4 lined pad. Pen not included. A4 black or grey compendium. Matt soft koeskin, exterior side pocket, full zip closure, gunmetal badge, multiple inside pockets, solar calculator, 600D grey lining and outer contrast, elastic pen loop, A4 lined pad. Pen not included. Zip round compendium, soft koeskin, full zip closure, exterior side pocket, gusseted inside pocket, solar calculator, elastic pen loop, A5 lined pad. Pen not included. Soft koeskin compendium with solar calculator. Side and top entry for notepad, full zip closure, multiple inside pockets, elastic pen loop, A4 lined pad. Pen not included. A4 compendium. Soft koeskin with contrast stitching, side and top entry for notepad, grey textured trim, satin pearl fittings and the badge, full zip closure, exterior side pocket, multiple inside pockets, USB pouch, elastic pen loop, A4 lined pad. Pen not included. Stylish and made from PU imitation leather with mesh trim. 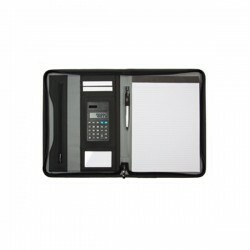 Features: Zippered compendium with internal and zippered pockets, 3 pen loops, id pocket and 5 business card holders, lined pad which inserts from the top. Pens not included. Available in 2 colours. Fits an iPad in the 2 Left side pockets. 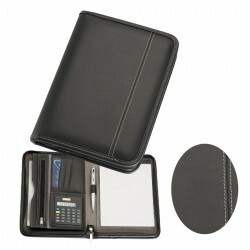 Leather-look and contrasting EVA foam construction with elastic closure, business card holder, pen loop and spiral pad which inserts from the side. 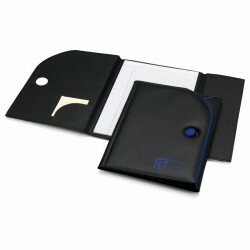 Made from koskin leather-look material with metal badge Features: Features include zipper closure, gusseted and zippered inside pockets, 2 pen holders, business card holder and lined note pad which inserts from the top. Pens not included. Metal badge engraves Champagne Fits an iPad in the left side pocket. A5 size zippered compendium in koskin leather-look material with white contrast stitching and taupe coloured EVA material contrast panels inside. 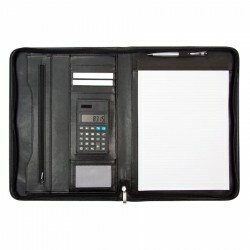 Features: Includes 25 page lined pad which insert from the top, solar calculator, internal pocket and zippered internal pocket, business card holders and pen loop. Pen not included. 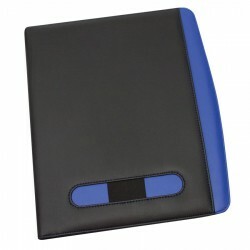 Made from modern pebble grain material with blue coloured bonded leather trim. 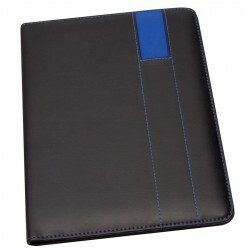 Features: Features include zippered closure, internal pocket, internal zippered pocket, pen loop, business card holders, metal badge, and lined pad which inserts from the top. Pen not included. Metal badge engraves Silver Fits an iPad in the left side pocket. 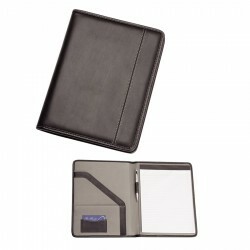 In durable Imitation Leather Features: Features zippered closure, internal gusseted pocket, internal zippered pocket, business card holders, pen loop and lined pad which inserts from the top. Pen not included. Fits an iPad in the left side pocket. 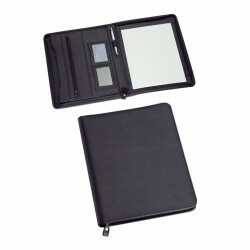 Made from imitation leather this expandable file has 6 compartments for document storage. 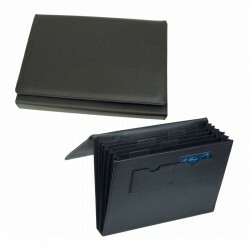 Features: Features include inside business card holders. 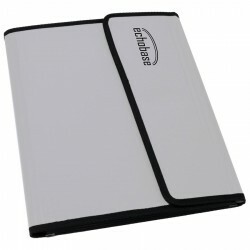 Economical A4 folder made from PVC, Microfiber and EVA material with elastic wrap for easy closure. Available in 3 colours. 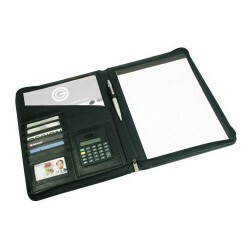 Features: Includes lined spiral pad which inserts from the side, pen loop, inside pocket and business card pocket. Pen not included. Fits iPad holder 9118. Made from soft-touch leather look material. Features: Features business card holder, pen loop, internal gusset and A4 lined pad which inserts from the top. Pen not included. 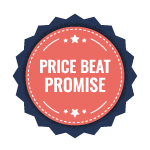 This portfolio; printed with your logo, is the perfect low-cost solution for your next meeting or conference. 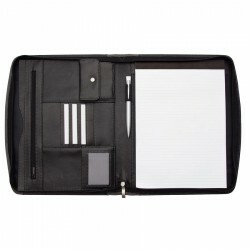 Featuring an A4 notepad, pen loop, business card pocket, internal pocket. Pen not included. This is the ultimate organiser for your next conference or event and it comes printed with your logo for great brand exposure. 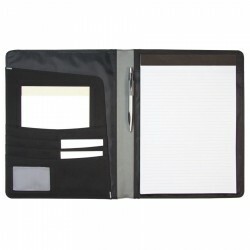 Featuring internal organiser with tabbed pockets, A4 notepad, pen loop, business card pocket, CD/DVD sleeve and velcro closure to keep everything secure. Pen not included. This handy folder is a great way to present your company literature, whether it's a presentation, corporate profile or marketing material. Insert a title card into the cover pocket and you can customise it for any occasion. 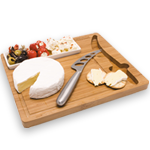 This is a multi-functional product that's great value for money. 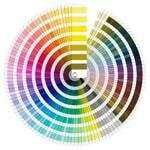 A quality A5 portfolio made with a soft grain finish. 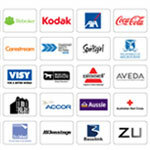 Your logo can be printed onto the portfolio or engraved on the brushed chrome accent plate (optional). 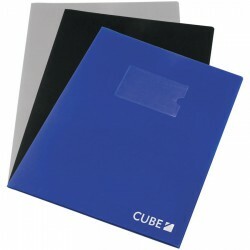 Features include a soft grain finish outer, micro-fibre inner, brushed silver accent plate, note pad, pen loop, card pocket and an internal brochure pocket. (Pen not included). This portfolio is both trendy in appearance and functional in design. 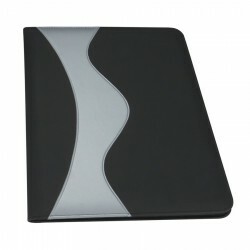 It features rubberised durable finish, note pad, internal brochure pocket, pen loop and business card pockets. Pen additional.